cherry pie | Pie, Oh My! Some people loved it, some people were disturbed by it, and most were confused, but no one could deny the lasting impact of David Lynch’s haunting 1990 television series, Twin Peaks. Set in the Pacific Northwest long before anyone heard of those silly day-walking vampires (sorry Twilight fans) Twin Peaks revolved around the mysterious death of high school beauty queen Laura Palmer and the kooky townspeople who knew her. At the heart of the series was Special Agent Dale Cooper, played by Kyle Maclachlan, brought in by the FBI to investigate Laura’s death and the nefarious elements surrounding her murder. 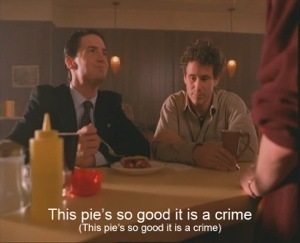 In typical David Lynch fashion, the disturbing and violent elements of the series were tempered with humorous moments often taking place at the Double R Diner where Dale Cooper and local Sheriff Harry Truman would go for a “damn fine cup of coffee” and a slice of cherry pie. While at the diner, the duo would piece together the mystery of Laura’s death and much more. This show is a gem and worth checking out. The full two season series is available on Netflix.